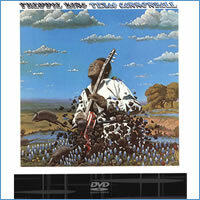 Freddie King's Texas Cannonball was initially released on Leon Russell's Shelter Records in the fall of 1970. King went on to record three albums for Shelter, but this one stands alone in representing the Freddie King sound so many fans still call "the best." Here, among King's originals, are classic covers of tunes by Jimmy Rogers, Howlin' Wolf, Elmore James, Leon Russell, Bill Withers, Isaac Hayes and John Fogerty. This is blues with serious grit and more than a tinge of rock. Incidentally, King, who died in 1976 at the age of 42, credited APO Records artist Jimmie Lee Robinson as the man who first taught him to play guitar. That story was confirmed by King's brother who contacted APO to relay similar accounts following Robinson's recent APO release, All My Life. Indeed, that's a pretty hefty endorsement even for Robinson, now widely-considered a blues legend. Furthermore, the liner notes (which do include mention of Robinson's influence) indicate fellow APO artist Jimmy Rogers as a major influence on King's guitar style. Specifically, King credited Rogers with teaching him the picking style he used to create his famous sound.